Injuries have sidelined Champion Anthony Hernandez. 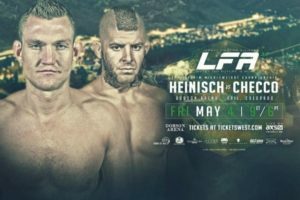 Legacy Fighting Alliance has announced the LFA 39 main event will put Colorado’s own Ian “The Hurricane” Heinisch against Brazilian Gabriel “Zamgeif” Checco with an interim Middleweight title on the line. Heinisch a 2-time Colorado state high school wrestling champion, has scored his last two wins inside the LFA Octagon submitting Lucas Rota & knocking out Daniel Madrid. Checco is on a two fight win streak having submitted Mike Jasper & Adam Stroup in fights under the RFA banner. The co-main event will also be at 185 as Jordan “The Beverly Hills Ninja” Wright squares off with Hayward “The Hybrid” Charles. Wright ran his undefeated record to 9-0 with a first round submission of Craig Wilkerson at LFA 30. Wright has won all his fights by stoppage, 5 submissions, and 4 knockouts. Charles has racked up all his wins by stoppage, 14 of 15 by submission. In the Flyweight division Santa Fe, New Mexico’s Jerome “The Renegade” Rivera faces Colorado native, Factory X’s Brandon “Raw Dawg” Royval . Rivera has 5 finishes all submissions, while Royval is 6 for 6, with 4 submissions and a pair of knock outs on his record. In the women’s Strawweight division a pair of undefeated Colorado natives square off as Maycee “The Future” Barber tangles with 303 Training Center’s Audrey Perkins. 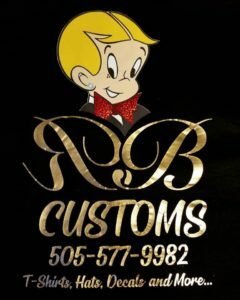 Barber has fought all her pro bouts in LFA, submitting Itzel Esquibel & Kaila Thompson. Perkins hasn’t fought since her pro debut, a unanimous decision win over Natalie Roy at Jackson’s MMA Series 17, in 2016. 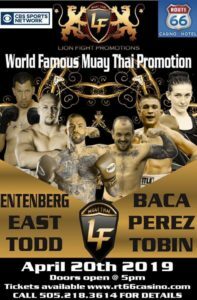 LFA 39 is scheduled for May 4th, at Dobson Arena in Vail, Colorado. The main card can b seen on AXS TV.